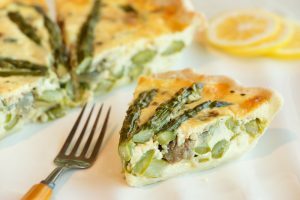 Celebrate gluten-free month by making veggie quiche at a GF cooking class. New Leaf Community Markets has several events this month, including ones to celebrate May being “gluten-free awareness month” and free movie showings. Here are some highlights; these are all at the Westside Santa Cruz location at 1101 Fair Ave. (831-426-1306). Preregistration is required at newleaf.com/events. 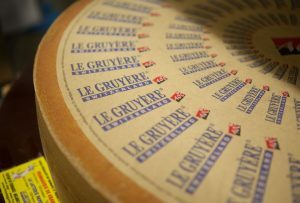 Attendees will learn about, and taste, several beer and cheese pairings with Groundbreaker Brewery and Snowdonia Cheese Co. Oregon-based Groundbreaker is a dedicated, gluten-free brewery. Locally sourced chestnuts and hops make for a unique, naturally gluten-free (and vegan) beer. Snowdonia, based in North Wales, is renowned for an “innovative and colorful approach to hand crafting their distinct range of cheeses.” In January 2017, Fine Food Digest released their “Best Brand Guide” and the Snowdonia flagship—Black Bomber—was awarded “Best British Cheese” (a distinction it has received two of the last three years). Join Chef Amy Fothergill for a hands-on cooking class where you will make fresh veggie quiche, rosemary prosciutto bread with fresh mozzarella, summer fruit crisp, waffles with berries, and luscious lemon tarts. Join Nutrition Consultant Madia Jamgochian and learn how a gluten-free lifestyle could benefit you, and how to save money when shopping for a gluten-free diet. Sample some of the products discussed in class and expand your gluten-free repertoire. This 2014 documentary uncovers the most destructive industry facing the planet today—animal agriculture—and investigates “why the world’s leading environmental organizations are afraid to talk about it.” With host Sandi Rechenmacher, Nutrition Consultant and educator. Free popcorn. Feature length documentary “What the Health” follows the journey of film writer/director Kip Andersen as he uncovers “the impacts of highly processed industrial animal foods on our personal health and greater community.” The movie has local roots: Santa Cruz producer Bill Meade is behind it. This is a rare opportunity to see an acclaimed film for free; it will be shown at the Nickelodeon later this month. With host Sandi Rechenmacher, and free popcorn. New Leaf Community Markets has several events in February including Valentine’s classes and workshops for kids and families. Here are some highlights; these are all at the Westside Santa Cruz location at 1101 Fair Ave. (831-426-1306). Ayurvedic practitioner and chef Talya Lutzker will introduce attendees to a spectrum of delectable chocolate desserts. You will learn “how the taste of sweet is of great benefit to the body, mind and spirit” and discover a “world of good-for-you sweet foods you may not have thought of before.” Plus, learn how to make your own delicious chocolate confections from scratch. For ages 8 and up: drop your kids off for a fun workshop led by Kristen Valenza of Living Roots Food and Floral. 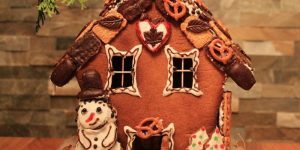 Valenza will provide homemade sugar cookies made from organic ingredients, and kids get to decorate with an assortment of toppings. This class with Kristen Valenza is for Moms or Dads and their little ones ages 3-6. 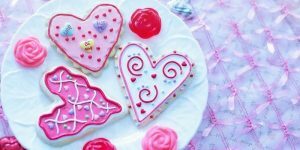 Families will decorate an assortment of Valentine’s Day cookies made from organic ingredients, then take home a box of creations to give away as gifts–or eat themselves! While you enjoy tea and snacks, you can learn which heart-healthy foods are high in antioxidants, fiber, omega-3 fatty acids, vitamins, and minerals. The session is led by Nutrition Consultant Madia Jamgochian. New Leaf Community Markets has a few lectures and classes this month. Here are some highlights; these are all at the Westside Santa Cruz location at 1101 Fair Ave. (831-426-1306). If you want to plan ahead, check out their site for lots of enticing offerings in January. These include a free series of Monday afternoon nutrition workshops beginning Jan. 9 (January Jumpstart: 4 Weeks to Healthier Eating with Holistic Nutritionist Madia Jamgochian), a paella class (Thurs. Jan. 26, $45 or two for $80, includes wine) and a “one-pot Ayurvedic soups and stews” class with Ayurvedic Practitioner Talya Lutzker (Tues Jan. 31, $45 or two for $80). For ages 8 and up: drop your kids off for a fun, creative hands-on workshop led by Kristen Valenza, founder of Living Roots Food and Floral. They will create houses from scratch using organic ingredients, and take home their masterpieces. Join us for tea time and discover how spices add more than flavor to your recipes. Full of antioxidants and potent antimicrobials, you may be surprised to find out what your spice rack has in store. Herbal storyteller Tom Dadant will give a lecture on how to support your body’s primary immune system naturally with beneficial herbs and nutrients. Dadant is a National Educator for Planetary Herbals. 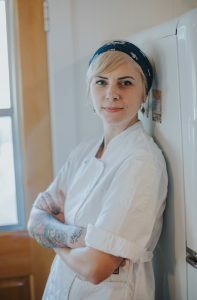 Beginning this week, Jessica Yarr is Executive Chef at downtown Santa Cruz restaurant Assembly (1108 Pacific Ave., 831-824-6100). For the last few months, Yarr has been collaborating with The Glass Jar, the restaurant group founded by Kendra Baker and Zachary Davis, on a number of events and projects. These included the Meander San Lorenzo River Dinner, Assembly’s participation in the Santa Cruz Farmers’ Market pop-up breakfast series this summer, Assembly’s participation in the Big Sur Food and Wine Festival a few days ago, plus the pastry chef direction of The Penny Ice Creamery. Santa Cruz Weekly named Yarr “Best Pastry Chef of Santa Cruz” in 2010. She has been serving as pastry chef at The Glass Jar since departing as Head Chef of Mint in Scotts Valley earlier this year. A graduate of Portland, Oregon-based Le Cordon Bleu College of Culinary Arts, Yarr’s goal at Assembly is to continue building a sense of community utilizing elements including passion and attention to detail. Yarr will be working with Assembly’s Sous Chef Trent Lindgren, who has been directing the kitchen at Assembly since previous Executive Chef Carlo Espinas returned to San Francisco earlier this year. New Leaf Community Markets has lots of cooking classes this month, including many with autumn-related themes (apple butter anyone? Yum). Here are a few highlights; these are all at the Westside Santa Cruz location at 1101 Fair Ave. (831-426-1306). Learn how to make easy and delicious apple butter and seasonal fall jam with Home Chef Lisa Bono using natural sweeteners. This class will cover equipment, ingredients, canning methods and storage. Take home two jars of your own creation. Time & Cost: 2–4pm, $25. New Leaf invites you to sign up with your sweetheart and work together to create a variety of tasty Spanish-style tapas while sipping wine with Chef Kristen Valenza and Nutrition Consultant Madia Jamgochian. Classic tapas ingredients that may be used include Marcona almonds, manchego cheese, prociutto, chorizo, shrimp and eggplant. Time & Cost: 6–8:30pm, $85 for two people. 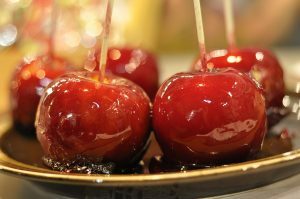 Drop your kids off for class and they will make candy apples using a variety of organic toppings while enjoying homemade ginger soda, while you can enjoy a date night. Time & Cost: 6–8pm, $25. New Leaf Community Markets has a lot of interesting cooking classes coming up this month. In addition, they have a few “tasting events” and nutrition/education lectures; some of these are free. Here are a few highlights; these are all at the Westside Santa Cruz location at 1101 Fair Ave. (831-426-1306). 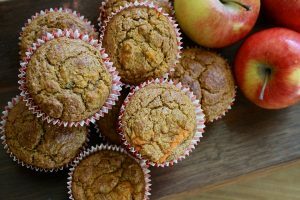 Learn how to utilize gluten-free grains and flours in delicious, gluten-free apple recipes. Nutrition Consultant Stephanie Horning will also teach you how specific ingredients support your health. Time & Cost: 6–8:30pm, $35 per person/$60 for two. Nutrition Consultant Madia Jamgochian will teach students how to assemble a pie crust from scratch and create delicious pies and galettes. Teams of 3 will prepare three different fillings: peach, rhubarb and blackberry. Time & Cost: 6pm–8:30pm, $35 per person/$60 for two. Discover which mushrooms improve immunity, lung function, brain function, athletic performance, the nervous and cardiovascular systems, and the whole body, with Host Defense National Science Educator Gina Rivers Contla. Time & Cost: 6:30pm–7:30pm, Free (pre-registration required). WSET-Certified Kristen Valenza will share how to properly pair different California varietals with local and seasonal farm-fresh cuisine. The class will include several wine and food pairings. Time & Cost: 6–8pm, $40 per person/$70 for two. Tickets are on sale for the entire 2016 season of pop-up breakfasts at the Westside Santa Cruz and Scotts Valley farmers’ markets. The first event is the morning of Saturday, May 28 at the Westside market with chef Kevin Koebel of Local FATT—see menu below. There is limited seating; $37 tickets are available for purchase online and at the markets. Different local chefs are featured at each event. For each dish at these multi-course meals, nearly 100% of the ingredients are sourced from farms at the markets. Event proceeds benefit the markets’ public educational programs including the Foodshed Project. Full menus will be posted on the web site as events draw closer. Santa Cruz’s Food, What?! youth empowerment program graduates provide service at the events, which begin at 9:30 a.m. Attendees choose their seats by placing their own plates and silverware at spaces along u-shaped, family-style tables. At 10 a.m., plates of seasonal cuisine made with ingredients sourced from the markets begin rolling out. As the guests eat and visit, farmers and chefs share their knowledge and perspectives regarding agriculture, community and consumer choice within the food system. There is also live local music at each breakfast. The first summer series occurred in 2013, and the farm-to-table breakfasts continue to draw sell-out crowds. For more information call 831-325-4294 or email education@santacruzfarmersmarket.org. 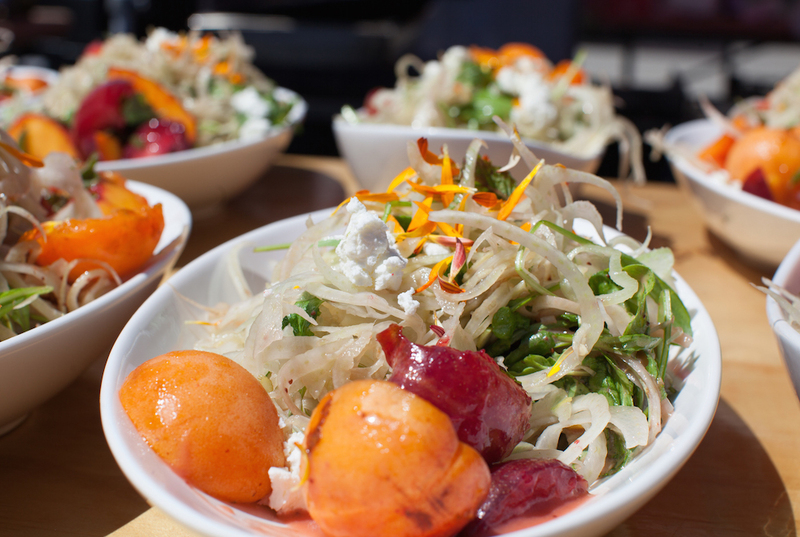 Read more about the Santa Cruz Farmers’ Markets. New Leaf Community Markets has announced a bunch of classes for April and May, and it’s offering a discount: 10% off any class that costs more than $20 (except series). To receive the discount, use promo code SPRING10. The organic, community market urges readers who are amateur chefs to sign up today and “Unleash your kitchenthusiasm” (New Leaf’s theme for April). Another reason to be enthusiastic at New Leaf? The sustainably farm-raised Mt. Cook Alpine Salmon is $3 off during April. Verified by FishWise as a “Best Choice,” this fish is free of hormones and antibiotics and raised in the pristine waters of New Zealand. Nutrition consultant and chef Madia Jamgochian teaches this class. If you love eating fresh salads, but sometimes lack the inspiration for making a tasty dressing, New Leaf encourages you to attend this class. Learn how to prepare yourself for the week by whipping up several different types of healthy salad dressings and dips that will “keep you reaching for the veggies.” Each attendee will get to take home recipes and a small jar of dressing made in class. Preregistration is required. Cost is $25 or $40 for 2 before discount. Wednesday, April 13, 6-8 p.m.
Home Chef Lisa Bono leads this hands-on workshop. Attendees will learn how to make classic pickles and pickle other kinds of veggies using vinegar, sugar and spice. The class will cover pickling and food preserving basics: equipment, technique, ingredients, storage, and recipes. You’ll leave class with a few jars of your own creations and the knowledge to start pickling at home. No experience necessary. Preregistration is required. Cost is $25 before discount. Saturday, April 16, 2:30-4pm. Goji berries, lecithin, bee pollen, lacuma and chocolate are all nutrient-dense superfoods. Join the Westside New Leaf’s Wellness Specialist Sundari Lauren in this hands-on cooking class. Using nuts, fiber, good carbs, protein and healthy fats as a base, participants will create a variety of flavor packed treats and take home a box of their final products. Learn new recipes and experiment with making your own unique favorite. Preregistration is required. Cost is $25 or $40 for two before discount. Wednesday, April 20, 6-7:30pm. 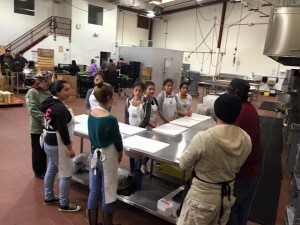 The NEXTies of Santa Cruz (organized by Event Santa Cruz) recently announced that Teen Kitchen Project is receiving the 2016 award for “Nonprofit Organization of the Year” and TKP has even more good news to share; keep reading for details. There will be a Teen Kitchen Project benefit brunch—actually two of them!—on Saturday, April 30 at the Santa Cruz Food Lounge (1001 Center St.). The TKP teens will be taking orders, cooking, and serving customers. A silent auction will have art, jewelry, flower bouquets, and more. There are two brunch seatings, 9:30 a.m. and noon. Tickets are $45 and include a menu featuring salad, fruit, baked goods, coffee, and tea. Each attendee receives an entrée choice (one selection is frittata with a side of Freedom Meat Locker sausage) and a choice of mimosa or orange juice. Kids under 12 cost $18. Purchase online. 100% of proceeds from tickets and auction benefit TKP. For those unfamiliar with Teen Kitchen Project, executive director Angela Farley launched TKP in 2012 after her son was diagnosed with cancer. Farley decided she wanted to help other families affected by cancer, to at least attempt to decrease some of the pressure and feelings of being overwhelmed. Today, the organization regularly delivers free, organic meals to about 50 families affected by cancer, and has delivered more than 49,000 meals since 2012. There are families in locations across Santa Cruz County. Right now, 40% of the clients they serve live within five miles of Watsonville, but they hope to be able to increase this number. That leads to the next bit of news. On March 7, TKP started cooking at the El Pajaro CDC (Community Development Corporation) Incubator Kitchen in addition to their original commercial kitchen in Soquel. They cook several days a week at the Watsonville kitchen, and will soon reduce their schedule to just two days a week in Soquel. The Incubator kitchen provides small groups of youth the opportunity to learn more about working as chefs in the hospitality industry. TKP’s “staff” adult mentor chefs are Stephanie Forbes, ElizaBeth Link, Cabrillo College culinary student Michelle Spencer and Cabrillo staff member Hector Quiroz. The “volunteer” adult mentor chefs are Tauna Coulson (Soquel kitchen), former Cabrillo Culinary Department instructor Kathy Niven (Watsonville kitchen), and Jesse Plasencia (Watsonville kitchen). The program doesn’t just help the families it serves, it also helps teens gain valuable skills as they volunteer. These individuals are ages 14 to 19, in 8th grade or above, and have come from most of the area’s high schools. Most who work at the Soquel kitchen are doing this in exchange for community service hours, but there are some who sign up just for the experience. The required commitment is every other week for a minimum of eight weeks. For more info on Teen Kitchen Project, visit their web site.